After a degree in geology, I had a career at the Science Museum as a curator, exhibit developer and education interpreter. In more recent years I taught and performed Egyptian dance. A year living in Peru, seeing the vibrant weaving, tapestry and embroidery there, rekindled my love of textiles and I decided to pursue this through further study. I completed the City & Guilds Creative Embroidery Certificate & Diploma in Design and Craft in 2012. 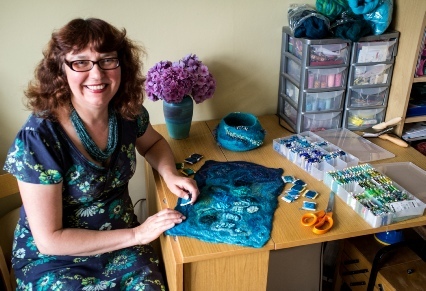 I exhibit both independently and with the well established Yorkshire based textile group Diverse Threads and from 2014- 2017 the Textile group Decora. I have taken part in the 2014, 2015, 2016 York Open Studios and exhibited in a solo show at Fringe@Studio 108 in Muswell Hill, London in 2014. I have created a number of commissions for private collectors and have experience running workshops, demonstrations and talks. My style varies, from abstract to more representational depending on the source topic and ‘feel’ I want to evoke, but it is always characterised by a strong use of colour and texture. 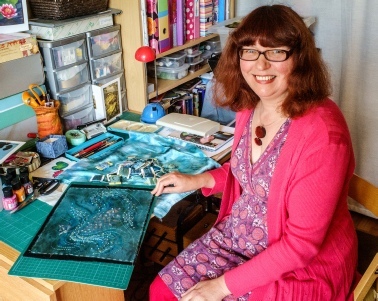 I work using a variety of techniques including felt-making, hand dyeing and appliqué combined with hand embroidery and embellishment. I love experimenting with wool, fabrics, fibres and non textile objects like pebbles and semi-precious stones. I create framed and unframed 2D pieces and more sculptural 3D pieces in a range of sizes. My aim is to capture colours, shapes and textures to evoke the feel of an place or object, so I chose the textile medium to suit the project, exploring the inherent properties of the materials. Though I have a clear idea of the end in mind and plan a project carefully, I tend to work intuitively often adapting a piece as it progresses, thus keeping a freshness and vibrancy in my work. Ideally I try to create different levels of interest in a piece, bold and eye catching from afar,with more details revealed on closer inspection. I keep returning to themes from the natural world such as landscapes, leaves, bark, the sea, water or beaches. But equally sometimes inspiration starts with a beautiful fabric or interesting yarn.